Hakone is noted for its onsen hot spring resorts, which attract both Japanese and international visitors due to its proximity to Tokyo. K's House Hakone is located only 1km away from Hakone-yumoto station. Voted The Best Hostel Chain Worldwide 2010 & 2011 and 2nd Best Small Hostel Chain 2014. Our communal natural onsen (hot spring) with open-air bath will be great experience you can enjoy and feel relaxed with. We do not accept large group (more than 7 people/2 rooms) bookings even if the bookings come from different persons/different booking site with the intention to form a group in the hostel. We have the right to cancel large group bookings. 3).Children aged 6 years or younger may not stay in dormitory room. We require 48 hours cancellation notice prior to your scheduled arrival, otherwise we will charge you cancellation fee as below. * 30% of your first night will be charged if you do not notify us about your cancellation or any changes by 21:00pm 2days before from your scheduled arrival. * 50% of your first night will be charged if you do not notify us about your cancellation or any changes by 21:00pm on the day before from your scheduled arrival. * 100% of your first night will be charged if you do not notify us about your cancellation or any changes before 11:00am on the day or No Show on your scheduled arrival. Loved the onsen and the view from the community room was awesome. Right next to K bus line on the "loop". This place was amazing! I wish I had stayed more nights here. Very spacious room for a hostel. Beautiful view of the mountains and valley. Open air bath was nice and the common room is very spacious. I had fun conversations with the other travelers here because the common room was a fun place to just chill in. Good location too. Would stay again! This is an absolutely fantastic place to stay. Very clean, beds are comfy, staff is helpful. The best part is the onsen, great for soaking after a day of exploring. Very social place with all ages and everyone from families with kids to solo travelers. Highly recommend. K’s was a great place to stay! The dorms are spacious and clean with a locker in the pod for your valuables. The location is a ten min walk from the train and bus station so is easy to get to all the main attractions. They also have a decent kitchen and large lounge area. The staff were super friendly and helpful. Very nice, especially for a hostel. 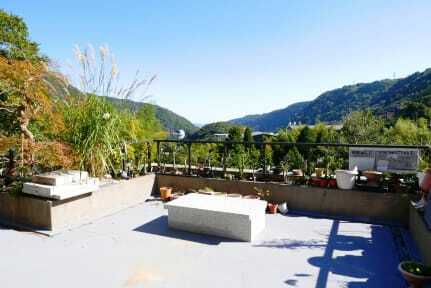 Serene setting with beautiful view from the deck and its own in-house (indoor and outdoor) onsen. The location is a bit of a hike (if you choose to walk it), but the distance from all the action of the train station area is part of the appeal. I had a relaxing stay and really appreciated the vibe between my stops in Tokyo and Kyoto. Super relaxing spot to hang out in after a long day in Hakone. The staff is wonderful and they have a lobby area you can lounge out in and relax The onsen downstairs is pretty good as well. Would recommend! Great hostel! I loved the onsen and rooms were nice, the views are beautiful! Don’t walk to hostel if you have a lot of baggage, it’s pretty far uphill! Sweet hostel offering both indoor and outdoor baths! 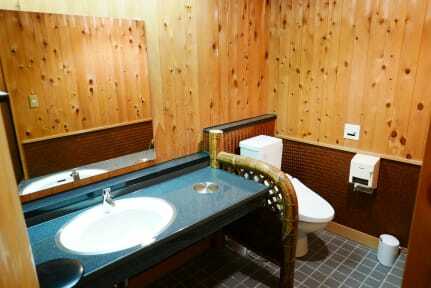 Also in a ryokan style setting which makes it even better as ryokans are usually really expensive. Did not have much of an atmosphere going on but I understand as Hakone is laid-back, peaceful place. Facilities and staff were good. Overall worth the money! Wonderful hostel in Hakone with easy access to transit, great communal spaces, cozy dorm beds and so convenient to have two onsens (one indoor and one outdoor) onsite after a day of exploring. Highly recommend. The common area is beautiful and really inviting to spend time there and chill. The kotatsu futon adds a nice touch and we liked sitting with our legs under it and talk and chill. The hostel was not very close to the center, but it was walking distance. Unfortunately we were a little bit disappointed by the onsen, it was a little bit too small, especially the one that was placed outside. All in all the place was welcoming and the stay was nice.